Virtuality is a premiere international event on Computer Graphics, Interactive Techniques, Digital Cinema, 3D Animation, Gaming and VFX. 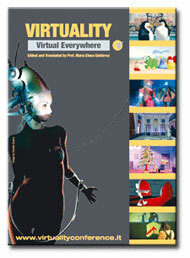 Every year, Virtuality proposes the most up-to-date discussion about cutting-edge applications of VR and Interactive Techniques in various fields, but paying particular attention to its industrial applications and to the multifaceted universe of cinema, including presentations by world-class experts of animation and visual effects. 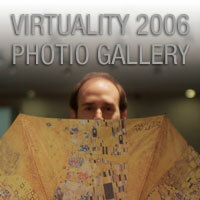 Virtuality 2006, REAL DREAMS, will continue to focus on exploring the increasingly fluid boundary between real and virtual worlds. Through lectures, meetings, tributes, exhibits, screenings and demo presentations Virtuality will reveal the new digital frontier sweeping from cinema to architecture, from automotive design to advertisement, from medicine to videogames. RESFEST comes to Italy for the second time! 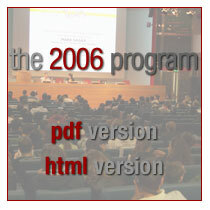 You can download the catalogue in Adobe Acrobat PDF format.